and literacy development in young children, ages two to five. Growth occurs at different rates for each child in this very important period of development that occurs rapidly, as they learn to become independent. The book encourages young children to feel secure as they develop, and experience their first encounters of making friends, while they explore the world and continue to become individuals. It is ideal for teachers, parents, and caregivers who wish to discuss how to share and play cooperatively. 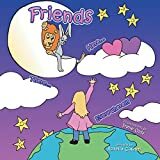 In addition to the topic of building friendships, this book helps develop recognition of words that are opposites and introduces adverbs (here, there, and everywhere). It can motivate children to inquire about friendships, relate to them, and suggests places to find friends, while strengthening reading and writing skills."